Look, we've all eaten some weird cereals in our time. Urkel-Os, C-3POs, random Monster cereals, Cupcake Pebbles, Vanilly Crunch, whatever. 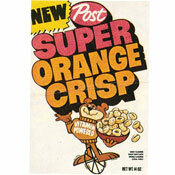 But there was a brief time in the 1970s-1980s when someone, somewhere, decided that ORANGE was underrepresented in breakfast cereal flavors, and set out to change that. I mean, what the heck?? I like a good glass of orange juice or a citrus fruit with my breakfast same as anyone. But I don't exactly want orange-flavored cereal, especially not if I am going to be putting milk on it. Quake's Orange Quangaroos (yes, the Quake who got sent back to his underground mines by Quisp). And for one brief year in the 1980s, OJs! Did you try any of these orange cereals? Were they as bad as they sound? Any other weird cereal trends you recall from our childhoods?